What Is The Best Trunk Organizer For Your Car in 2019? →What Is The Best Trunk Organizer For Your Car in 2019? Is the inside of your car always looking chaotic? If so, it might be time to start getting things into better shape. Today, we’ll walk you through some of the best trunk organizers on the market. These nifty devices come in handy for everything from keeping your shopping from overspilling through to making sure the kids have somewhere to put their toys on a long journey. We’ll get right down to business with some brief, honest reviews of 8 of the very best trunk organizers on the market. Why Do You Need a Trunk Organizer? What Size Trunk Organizer Do You Need? How Many Compartments Does The Trunk Organizer Have? A nifty organizer that’s built to last, you’ll be able to tie this storage trunk down to prevent any unwanted spills. It’s packed with pockets and comes in at a very keen price point. Drive Auto is a brand you can rely on. Available in 3 colors to co-ordinate with your ride, this trunk measures up at 17” x 23” x 10.75” so there’s ample space. With 2 oversized front pockets and 8 side pockets, you can make sure everything’s in its right place. The strap allows you to secure the unit neatly and keep everything to hand inside the car without worrying about spillage or the organizer becoming a projectile. For a solid, affordable and attractive storage solution, this Drive Auto organizer makes perfect sense. 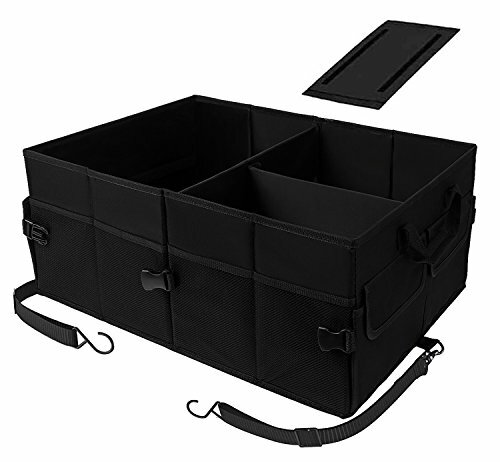 Another cost-effective way of keeping your belongings organized in the car, this collapsible unit from FORTEM has an understated design with build quality uppermost. Backed by a lifetime guarantee from the manufacturer, you can buy with complete confidence. This substantial car trunk storage organizer measures 21.5” x 16” x 10” so it’s big enough for all the toys and sports equipment you might need to stash safely away keeping your car immaculate. Some nifty strips on the bottom put a stop to any unwanted slippage and the rip-resistant 600D nylon is built to stay the distance. With 3 large main sections, 4 pockets and 2 pockets with lids you can keep everything nicely compartmentalized. Rigid when in use but collapsible for your convenience when you remove the base plates, you’ll also get a pair of handles so you can carry your groceries back indoors fuss-free. 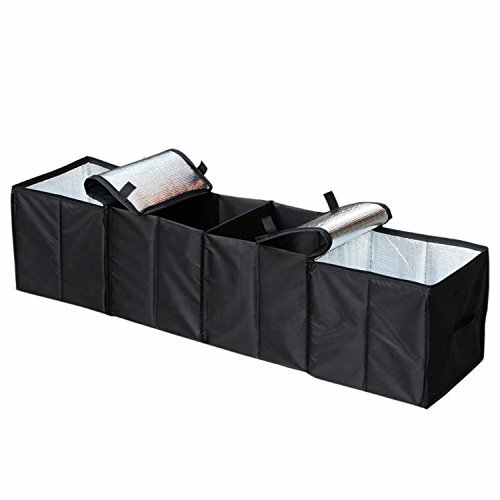 The lifetime satisfaction guarantee removes any reason not to buy this car trunk organizer. This expandable and robust storage container from Starling’s is a little pricier than some of the competition but still great value. The long-lasting 1680D Oxford polyester and extreme versatility help explain the price tag. With a lifetime guarantee, you’ve got absolutely nothing to lose. This Oxford polyester trunk organizer from Starling’s is a truly multipurpose method of keeping everything spick and span inside your car. You can expand or collapse the sections according to your needs for maximum versatility. Overall dimensions when extended are 23.6” x 14.6” x 12.5”. 10 pockets and an inside pocket mean you can segregate a range of possessions without any clutter or confusion. Unlike many organizers, the handles are extremely durable and won’t let you down. While it’s not exactly cheap, it’s this attention to detail combined with outstanding materials that mean you won’t regret digging a little deeper to keep your car immaculate. Available in a range of muted colors, Autoark roll longevity and performance into one pocket-friendly package with this generously sized trunk organizer. Suitable for all vehicles from compact cars through sprawling SUVs, this bulky but collapsible unit is well worth popping on your shortlist. 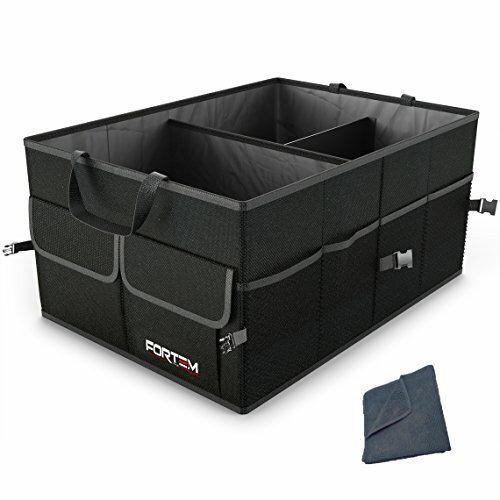 If you’re looking for a roomy trunk organizer made from Oxford polyester in dense 1680D, Autoark has you covered. At 22.8” x 14.6” x 12.6”, you’ve got all the space you need without this trunk dominating your car. Make use of one main section or pop in a pair of dividers if you want to separate your belongings. There are 11 pockets and plenty of buckles to guarantee secure enclosure. The handles are more than fit for purpose and all stitching is heavily reinforced. Autoark stands behind this product by offering a no-questions refund or replacement during the lifetime of the organizer so what more can you ask for? Next up in our look at the best car trunk organizers is a budget storage solution that doesn’t compromise on quality. The stripped-down simplicity of this organizer gives you everything you need and nothing that you don’t. Spacious and capable of loads of over 30 pounds, check out the MaidMAX today. The MaidMAX is constructed from Tetoron and mesh which is rugged enough to withstand the rigors of being knocked about in the trunk of your car. At 25.5” x 13.5” x 13”, you’ll get ample room to house all your groceries or anything else you see fit to store inside. There are 2 main compartments inside along with some mesh side pockets. Collapsible when not being used, this space-saving storage organizer also packs a couple of solid handles so you can lug your groceries indoors without needing to unpack them. This is a very worthwhile budget option. 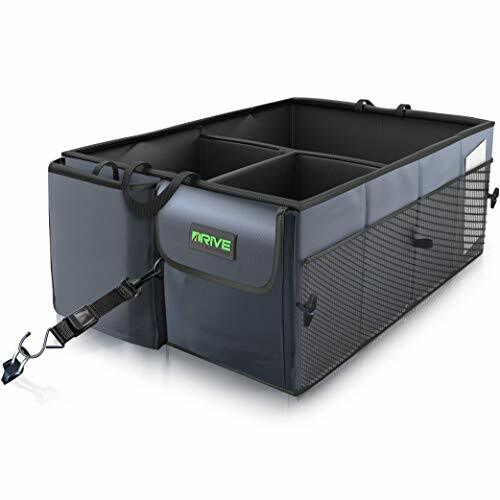 A sizeable and much larger storage unit, this model from Cargo is ideal if you have a larger truck and need to keep plenty of supplies handily organized. 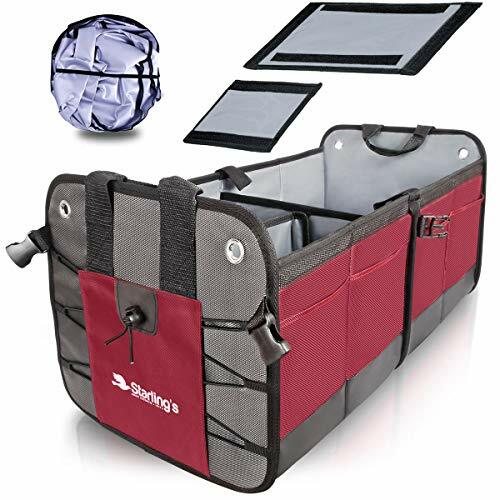 Insulated to keep things warm and boasting more than double the space of many competitors, the most incredible thing about this organizer is its rock bottom price. While build quality is not as strong as some of the competition, if you place a premium on size and budget when you’re looking for a trunk organizer, the Cargo is the obvious choice. Measuring a whopping 45” x 11.8” x 11.8” when fully extended, make sure your trunk is big enough to house this organizer and you can kiss goodbye to your work tools or sports gear floating round in disarray. Insulated to keep any snacks or coffee warm when you’re on the road, the only real downside of this unit is its strength and durability. At this price point, though, you really can’t grumble. If your budget is a little more fluid and you’re looking for an eye-catching way to keep the trunk of your vehicle spotless, this collapsible organizer is a must. Choose from 6 striking colors to coordinate with your car interior and enjoy a premium product made from Oxford polyester that might keep going longer than your car. Trunkcratepro, as the name suggests, is the perfect way to restore order to a chaotic vehicle. Whether you want to use it as a repository for toys or groceries, sports gear or work equipment, this 23.6” x 14.6” x 12.5” beast provides all the space you need. The divider allow you a great deal of customization when it comes to the configuration and you’ll get more pockets than you’ll find on competing trunk organizers. Waterproof and fashioned from high-grade Oxford polyester, you’ll have to spend a little more but you’ll be rewarded with a top-tier storage solution. Have you always wanted to make more use of the wasted space in your car trunk? 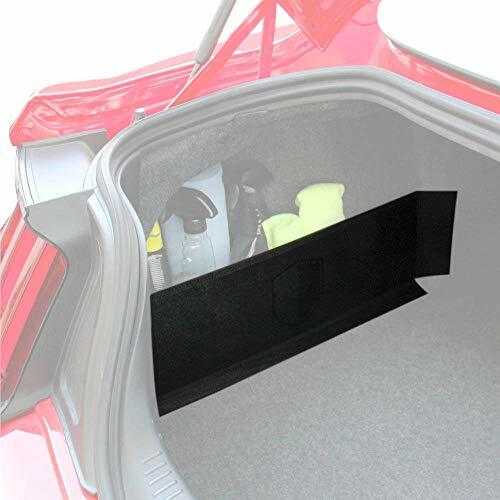 Red Shield delivers the answer in the form of this innovative organizer that slots into the sides of your trunk allowing you to keep everything in place while remaining secure. While the Red Shield organizer is relatively compact at 24” x 0.2” x 6”, you’ll still get enough room inside while also leaving the bulk of your trunk free for larger items. If you want to keep your car emergency supplies or some work equipment out of harm’s way while still enjoying sufficient storage in the body of the trunk, the side-fitting design is a marvel. If you spill anything, simply remove and wash down the organizer. Everything stays nicely in place thanks to a simple but effective elastic strap. First and foremost, think about the size of the trunk organizer in relation to the dimensions of your vehicle. There’s no point angling toward the largest organizer available if you drive a compact vehicle with limited space. Equally, if you have a large truck or van and you’re looking to keep more things in check, it’s senseless looking for an ultra-compact organizer. This might seem like common sense but all too many people rush in, buy without adequate forethought then end up with an organizer entirely unfit for purpose. Whether you’re planning to hook the organizer over the back of your seats, pop it in the trunk or even place it on the bed of your truck, make sure there’s enough space before steaming in. Also, keep your expectations realistic when you’re looking for this type of storage solution. If you’re intending to make a lengthy road trip and you want a home for a large stash of supplies, you might be better off considering something like a roof rack box to house more substantial equipment like sports gear. You should pay close attention to what the trunk organizer you have in mind is made of. 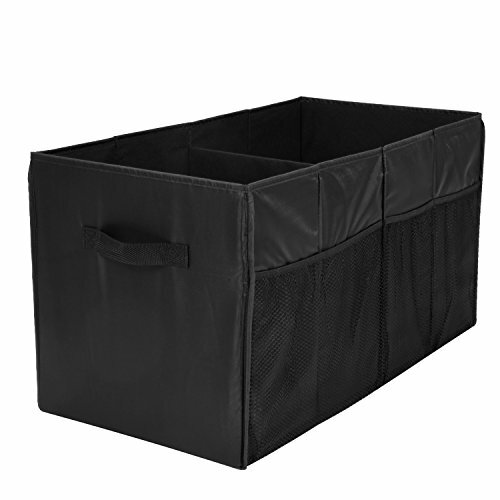 The majority of these types of organizers are made from polyester which is more than durable enough for most reasonable requirements. Make sure that all the hardware and accessories are sturdy and secure enough for your needs. With the lining, you should focus on getting something that’s at minimum moisture-resistant. Many cheaper trunk organizers will collapse in on themselves when they’re empty so, if you’re looking for somewhere to store the groceries after hitting the store, avoid these and look for something with a fixed shape. 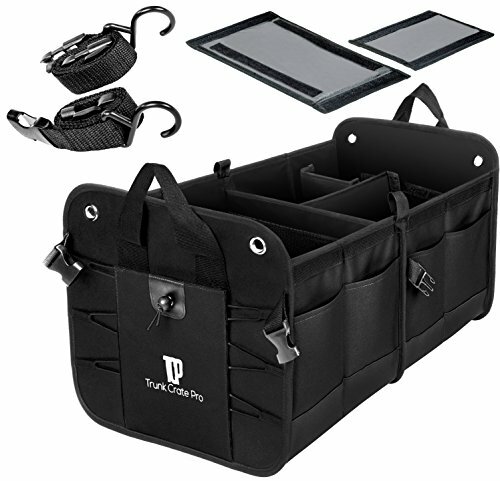 A number of the more versatile trunk organizers are adjustable which makes perfect sense. Your storage needs might change from day to day or week to week and a flexible organizer is the ideal solution. With some of these organizers, you’ll be able to fold compartments in when they’re not in use to minimize space. Usually, some sort of buckle and clasp arrangement will make rejigging it the work of seconds. Think about your specific needs here as there’s no right or wrong answer regarding the optimum layout of a trunk organizer. If all you plan to do is throw in a bunch of sports equipment then a one-piece unit is probably more than good enough. If, though, you would like to keep distinctly different things organized in one organizer, it pays to look for something with a few more pockets and subdivisions. We very much hope you’ve found some useful hints here today that will help you toward getting the best storage system for your vehicle. With just a little planning, you can easily avoid an expensive mistake and end up with the best trunk organizer for your requirements without needing to spend a fortune.